Python training in Chennai at Credo Systemz helps you to get an extensive knowledge of Python programming language. Python course training by Credo Systemz is an instructor-led training conducted in Chennai premises. Python course content designed by us is unique which helps you start learning Python course in Chennai from basics to advanced Python concepts. 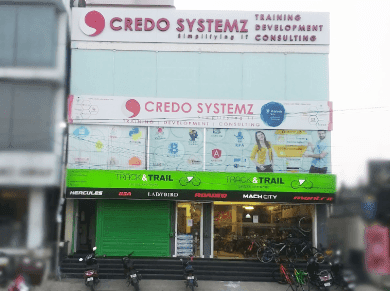 As per the reviews across the internet Credo Systemz is the Best Python Training Institute in Chennai, Velachery and OMR. Python language is a very popular one and it stands out to be one of our premier courses. Our Python Instructors are high-skilled with Python programming and having 12+ years of experience. We ensure that the best python course in Chennai at Credo Systemz will be more practical oriented and at the end of the course, you will have much knowledge to develop a Python Application alone. Credo Systemz ensures the Best Python training experience during the course of your training program. Python is an Object oriented, high level and multi purpose language. Python is very easy to learn and can be interpreted to more number of Operating Systems including Unix based systems. Python makes debugging easily because there are no compilation steps in Python development and edit-test-debug cycle is very fast. BBC's 'Monty Python', a comedy series, released during the late 1960s was a huge hit. The Python programming language, released in early 1990's, eponymous of the comedy series, turned to be a huge hit too, in the software fraternity. Reasons for the hit-run into a long list - be it the dynamic typing, or cross-platform portability, enforced readability of code, or its ability to take the shape of a scripting or a programming language or a faster development turnaround. The OOP features such as inheritance, polymorphism and encapsulation support reusability as well. However, OOP is an option in Python. You can still write a simple script to calculate the complex Dijkstra's algorithm for mathematical computation without using OOP. But, if you check the PyPI (Python Package Index) list of available modules, even the Dijkstra's algorithm is available as a module you can plug & play. Such is the comprehensiveness of the modules index. The Python Developer Proudly say that the following Most Popular Websites using Python Language. Strong knowledge in Python Scripts and its statistics. Real-time experience in Python Library and tools. Gaining the knowledge on Python modules. Hands-on Knowledge in GUI Programming. Master in concepts of Databases and Persistence. Good Knowledge in internet scripting. Depth understanding of Python 3.X Changes. Credo Systemz providing the best quality of Python Training in Chennai with Topmost Experts. Offering flexible Timing and affordable fees structure for Python Training. Best Classroom, online and corporate training also conducting. Guide you to solve the challenges on Coderbyte in Python and also providing good quality of Course Materials. Easy to catch the Python Certification Examination after completing the Python Course, Since we are one of the Pearson Vue's official partner. Providing 100% Placements Assistance during the period of Python Training. After Completing Python Training in Chennai at Credo Systemz, you become a Proficient Python Developer with the High Paying profession. Detailed instructor led sessions to help you become a proficient Expert in Python. Build a Python professional portfolio by working on hands on assignments and projects. Lifetime access to downloadable Python course materials, interview questions and project resources. Offering Python Training in Chennai on your flexible timings. In addition, Online Python Training. Our Python course content designed in the manner of Practical and Job oriented, So beginners too easily learn Python. You can start write code from 1st day of your Python Class. We are offering free placements until you get a job. Our Python Course instructor have done Python course certification, so he will guide you in a best way. Offering Job based and Real time practical oriented Python Training in Chennai, It will be helps you to understand with real time examples. Inaddition You are going to learn Python course from the BEST Python Training Institute in Chennai. Offering Professional Python Training in Chennai from Industry Expert trainers same as you become a Professional Python Developer. 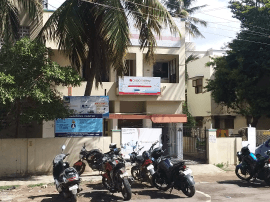 Ranked as Best Python Training in Velachery, Chennai with More than 100 reviews across the Internet. At the end of our Best Python Course, we will give you the knowledge about how to use Python with Data Science, Python with Machine Learning, Python with Big Data Hadoop. We Owe YOU Knowledge, 100% REFUND if YOU are NOT Satisfied. If YOU get satisfied then grace yourself to be one of the finest Python experts in the industry. Become a Python Expert by enrolling for The Best Python Course Conducted by Credo Systemz in Chennai. What is the Python Course Duration ? Our Best Python Course Duration is 40 to 50 hours. In this duration, we will give you more python programming examples. You will get various levels of Python assessments. You have to work on a real time Python Project. After the Python Course Completion, What is My Level ? After completion of your Python Training, You can develop any levels of Python projects professionally. What About Placements Assistance ? Will you help me for Interviews ? In the middle of your Python training, we conduct three mock interviews. In the Mock Interviews, We will figure outs your Technical competence and where you need to Improve. So after the mock interview surely increase your technical skill and interview confident level. Also we will help you for Resume preparation and Interview presence. Sample Resume formats for All different Technologies. Is there any prerequisites to start learning Python ? There are no prerequisites to start learning Python. The only prerequisite is your Interest. Python is very easy to learn. Is there any certification available for Python? Yes, Pearsonvue offers Python certification examination as associate and professional level. You can easily clear the Python certification exam once you have completed Credo Systemz Python training program. What are the other courses you offer with Python?